Join the discussion on our forums! Come discuss Fluffy Potion Drinker over in our dedicated Fluffy Potion Drinker discussion topic. Starting to love this card. As others have said, it's an amazing tech option against OTK decks. Still seeing a decent amount of DK Pallys, and this card has won me every single game. This card stalls games better than Loatheb ever did. I've been running it in a control warlock deck. You can even just play it once you get ahead on board to shutdown the opponent from any big board clears or power swings. If you haven't crafted it already, then you should. Shuts down any kind of Mecha-Cthun deck or Death Knight Paladin. Not fool-proof against OTK Priest but a dam good tool to have. Recently added this little gem to my Deathrattle Hunter deck and just now had the ABSOLUTE PLEASURE of getting to use it against a Mecha'thun Druid. Totally threw him off his game and was able to easily finish him off a couple of rounds later. Aaahhh. Turns out this is the GLORIOUS combo killer we've all been asking for! It's not a bad card, but haven't had it be the winning factor in any of my matchups... Yet. Everyone will see this card in meta decks in 2019. I think it will be a great card versus druid ramp. You can make slow the deck. Also with others control decks. She sounds like Widowmaker from Overwatch. I've been having fun with this card in my Wild Quest Druid deck. After you play Barnabus the Stomper, mana becomes a lot less important, and you still have enough mana to play Nourish on your next turn. I've been thinking about this card in wild Shudderwock in particular. Combo this with Loatheb and Booty Bay Bookie to fill your opponent's hand with a constant stream of 5-mana coins. They effectively have 1-mana to play with each turn, and any time they use a card that isn't a coin to answer your board of 6/6's, it's replaced by another effectively 5-mana "do nothing" spell. Isn't King Mukla not better - 2 6-mana bananas per battlecry instead, plus a better body from Mukla himself? got her, what am i supposed to do with her? So of course control decks may use this to delay combo decks, which is already good enough to find place in some decks. 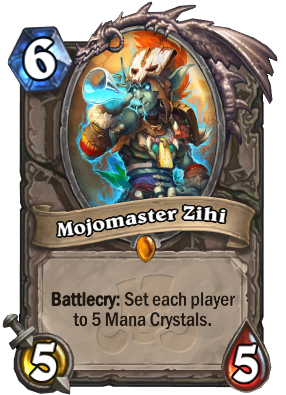 But "set each player to 5 mana crystal" sounds like 5 full mana crystal (that is, not empty). So an aggro deck could use this at turn 10, using a 4-mana minion, then this minion, then having 5 more mana, and your opponent would only have 5 mana to answer a 15-mana worth board. I hope this is not the case, because it would become a universal card that would be slammed into every deck, and I'm hopping someone proves me wrong. In your scenario (use this at turn 10, using a 4-mana minion, then this minion) that would leave the player at 0 out of 5 crystals, so no. I despise Togwaggle Druids, so I'm looking forward to this.